Are you tired of walking into a dark room and having to fumble around to find the light switch or lamp? If so, you are likely looking for a better, smarter solution. The good news is, motion sensor light bulbs have become much more popular for use at home and in business settings. With these lights you don’t have to wonder where the light switch is or trip over everything in your path – the bulb will automatically turn on as soon as you enter the room. An even better factor is the best motion sensing light bulbs don’t consume as much power like the electrically charged ones. Motion sensing works up to 30-feet away, giving you plenty of motion sensitivity in essentially any room of your home. These bulbs are simple to install and use. These bulbs provide instant illumination when motion is detected as far as 10 feet away. With automatic dawn and dusk sensitivity, these bulbs last longer and use less energy. They can be used inside or outside of a home. No fumbling in the dark, energy savings and money savings – using motion sensor light bulbs offers a win-win-win situation. If you are ready to buy motion sensor lights, you may want to know what options are available. Learn about some of the top products available to purchase here. The Smartsense outdoor floodlight is simple to use and provides the security results you want and need. The floodlight is designed with a motion sensor built in the bulb. It has the ability to detect motion within a distance of 30 feet, which means you receive peace of mind with this light bulb. You don’t have to worry about rewiring anything since you can just twist the Smartsense floodlight into any standard fixture. Once the initial calibration is complete, the bulb will begin to work. Once it comes on, if no additional motion is detected within a period of 90 seconds, the bulb will switch off automatically. The Smartsense bulb is ideal for adding additional lighting to unfinished basements, patio steps, doorways, and driveways. With this bulb in place, you no longer have to worry about fumbling around for pull chains or switches in attics, pantries or closets. 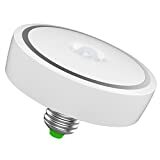 One of the most appealing features of the Smartssense light bulb is that it is a standalone motion sensing product and doesn’t have to pair with your other security systems in place. 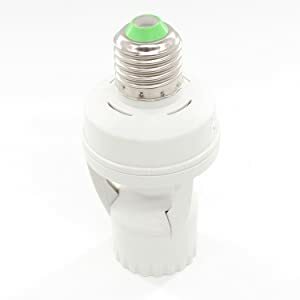 With a quick twist in your standard socket, you will receive a wide-angle of 110 degrees of light detection to help you know if any movement is present in your yard or around your home or business. Are you searching for a way to make your life a bit easier? 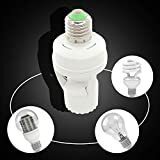 If so, you can quickly and easily install the First Alert Motion Sensing Light Socket into your existing socket and then screw your desired bulb into the fixture. This socket can only be used indoors and should not be placed outside. The socket offers a number of appealing features, including hands-free operation. The light will turn on automatically when someone enters a room and then turn off when they leave. It features a 360-degree motion sensing capability with a range of 12 feet when installed near areas that receive the highest amount of foot traffic. This socket will work with incandescent bulbs of up to 100 watts and compact fluorescent bulbs of as much as 50 watts. The Xcellent Global Light Sensor Socket is the ideal option for E27 screw-socket bulbs. It uses infrared light from humans as the control-signal source. All you have to do to use this product is to screw it into your existing light socket and then screw your selected bulb into the fixture. Keep in mind; this socket is only able to be used indoors. When someone enters a space, the light will turn on automatically and turn off when you (or another person using the space) leaves the room. It features an adjustable time delay that ranges from 10 to 120 seconds, which helps to save energy. Once installed, the light socket is also able to identify daytime and nighttime automatically, and you can choose the moon icon, included on the fixture, to work during the night only, and the sun icon can work during the day and night. This light is perfect for a number of applications from stairs, an aisle, bathrooms, garage, laundry room, the basement or even a walk-in closet. Are you searching for a motion detection light product that provides superior light while being good for the environment? If so, you are in luck. The iRainy LED light gives you the high-quality light you want and need, with minimal power consumption. This Warm Light bulb is perfect for installation in a number of locations thanks to the motion detection mechanism that is installed. Due to the LED technology used by this light, you don’t have to worry about excessive amounts of heat being produced. 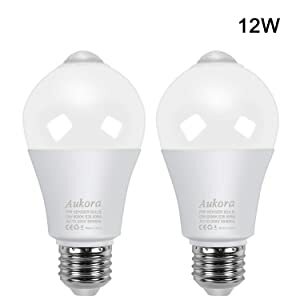 This also helps to extend the lifespan of the light, produce a brighter beam of light and provide you with a bulb that has a longer service life than other models and options on the market today. The fact is, this light consumes only 20 percent of what a traditional incandescent bulb will and it will last for up to 10 times longer than these traditional bulbs. You can use this bulb at home, in your office or anywhere else you need additional light. The motion sensing mechanism ensures that the light turns on when someone enters the detection range and then switches back off when no human movement is detected. The QPAU LED bulb offers high-quality light that uses less energy than other similar products on the market today. It provides superior illumination for your home and business to enhance security and safety. 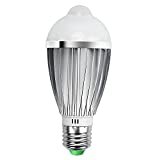 In addition to producing a highly bright light, this bulb has been enhanced with the unique PIR motion sensing capabilities. You don’t ever have to come in contact with this bulb for it to work, or flip a switch. The unique technology integrated into this bulb is able to detect when you enter into the space and automatically turn on. Also, when you leave the bulb’s vicinity, it will shut off automatically.
. 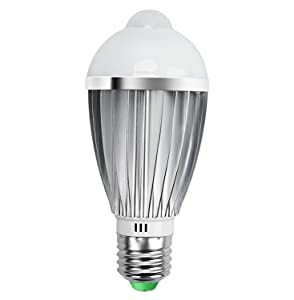 In fact, the longevity of this bulb is up to 10 times longer than more traditional fluorescent lamps and only uses 20 percent of the power that the popular incandescent bulbs use. Running your hand along the wall of your closet in search of the light switch can be frustrating. Alternatively, in some situations, you may have light switches that are nearly impossible to locate in the dark. Sengled’s soft white led light bulbs can solve these and many other problems easily. They provide a quick and easy lighting solution without the necessity of installation gear or hardware. Just screw them in and you have instant motion sensor lighting in any room of your home. No longer will you find yourself groping around in the dark looking for a hallway switch. Sengled LED Motion Sensor bulbs are sensitive and intuitive. Their built-in motion detectors utilize integrated sensors that will automatically illuminate when motion is detected from up to 30 feet away. You’ll get 90 seconds of light, giving you plenty of time to locate a light switch while still saving energy. You can use them as everyday bulbs as well. When the light switch is in the on position, the bulbs will detect motion automatically. Switch bulbs to regular functionality by flipping the switch on and off quickly. That way, you can use the bulbs as you would any other light bulb. This is a simple and versatile lighting solution that can make your everyday life significantly easier. This is a simple to install and easy to operate lighting solution for pretty much anywhere in your home. You can use these bulbs as regular light bulbs by deactivating the motion sensor with a quick on and off toggle of your light switch. Keep in mind that these bulbs cannot be used outside and are not any more durable than a regular light bulb. Sensitive – motion sensing works up to 30-feet away, giving you plenty of motion sensitivity in essentially any room of your home. Versatile – can be used anywhere in the home and easily set up to function in two different ways. Easy – these bulbs are simple to install and use. Good price – these bubs come at a very budget-friendly price. Not for outside use – these bulbs do not work outside of the home. No ambient sensor – these bulbs turn on in the daytime unless you set the switch to regular functionality by quickly flipping it on and off. 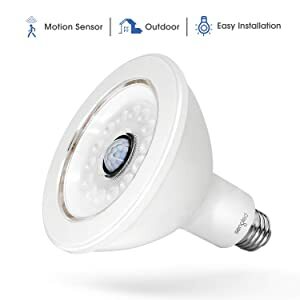 If you need motion sensor lighting for your garage, porch, basement, a hallway closet, or anywhere else in or outside of your home, these bulbs make a great option. They provide a reliable and easy lighting solution for nearly any situation. Witht These E26 bulb 12W or 100-Watt equivalent power output, you’ll find that they’re more than bright enough for most applications. They’re equipped with fast and responsive motion sensors that give you immediate light as soon as they’re triggered. As security lights, you’ll find that they give nearly instantaneous illumination so as to shed light on anything that passes under them. The high-quality PIR infrared sensors in the tips of each bulb cause them to light up immediately when motion is detected within 8 to 10 feet. Extend the motion range to as great as 10 feet by hanging the bulbs a bit higher up. Sensitivity can be adjusted by changing the angle of the bulb as well. These bulbs can operate in temperatures ranging from 14°F(-10°C) to 95°F (35°C), so they aren’t ideal if you live in colder areas. However, these bulbs can be used to solve problems within your home as well. Use them in the hallway or in other areas where you have visibility issues at night. With automatic dawn and dusk sensors included, you can save energy and extend the life of each bulb. These bulbs work better in areas where natural light is available throughout the day and long-range motion detection is desired. While they will function decently and provide help within a home, we feel that they are better suited for porches, garages, balconies, and the like. They also will not work when covered by a closed light fixture. If you need a motion sensor bulb for your sunroom, garage, porch, greenhouse, balcony, or driveway, this is a great option. They also can be used indoors, as long as they’re exposed to some amount of natural light. 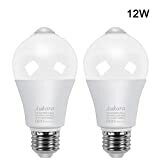 On the downside, if you live in an area that experiences temperature extremes frequently, these bulbs will not work as well. Additionally, they must not be covered by light fixtures. Still, for the price and quality, these are a versatile and helpful lighting solution for any number of applications. Sensitive – these bulbs provide instant illumination when motion is detected as far as 10 feet away. Efficient – with automatic dawn and dusk sensitivity, these bulbs last longer and use less energy. Versatile – they can be used inside or outside of a home. Not for extreme temperatures – these bulbs are not ideal for areas with temperatures constantly under 14ºf or over 95ºf. Better for outdoor use – they work best in areas where they can sense the natural daylight and utilize their dawn and dusk sensitivity features; in a home, they may light up during the day if they don’t have adequate exposure to natural lighting. Must not be covered – will not work when covered by a lighting fixture or shade, the bulb must be completely exposed. If you are ready to purchase your own motion sensing lights, you may still have a few questions. After all, making sure you get the best results from the product your purchase is a top priority for most people. Here you can find some of the most commonly asked questions, along with the answers that will help you make an educated and informed decision. When you are educated about what is available, you will be able to make smart buying decisions. Which motion sensing light bulbs can I use outdoors? The majority of the bulbs that are used for motion sensing are not designed for outdoor use. If you try to use some of these bulbs outdoors, they could cause serious issues, including a short or even an electrical fire. However, the Sengled Smartsense Security Floodlight is one bulb you can count on to provide you with the outdoor benefits that you want and need. 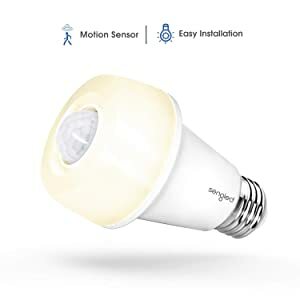 If you are searching for a motion sensing light that will be able to be used outdoors, you can count on this bulb to deliver the results you are looking for and enhance the safety and security of your home or property. How does motion sensing work? The motion detecting devices in motion lights are essentially small, electronic eyes that are designed to find infrared waves. These are heat waves that come off of any object that is moving. When the detection device senses that an object is moving across the field of view – especially any object that is warmer, such as animals, people or cars – it will automatically cause the lights to come on. The video below is meant for Arduino DIYers but explains very well how PIR (passive infrared sensor) motion sensors work. The light will then remain on for anywhere from one to 20 minutes depending on the one you have installed and the settings you have chosen. When the movement has ceased or moved out of the detector’s line of “vision” the light will shut off automatically. In most cases, the photocell will deactivate when the sun is out, and the majority of modern motion lights will have a semicircular field that ranges up to 240 degrees; however, this may be adjustable on some of the newer products that are available. Which types of light bulb should you get for the socket? 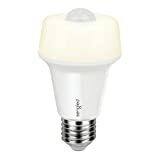 The light bulb you will need for the motion detector socket will depend on the brand and type of product you purchase. The most common type is the E27 Edison Screw (here is an article explaining the different types of light bulbs). You should read the fine print on the box carefully to find out exactly what you need to purchase. In some cases, a standard light bulb will work, but this is not always the case. Make sure you know what you need before trying to install the socket or bulb. If you are searching for a way to “light up the night” or prevent yourself from tripping over furniture when you try to find the light switch in a dark room, then you need a quality, motion detecting light bulb. The fact is, there are quite a few options to choose from today. As a result, you will need to evaluate the options and find one that best suits your needs. Taking your time to learn about the different options is the best way to ensure you get the best motion detecting benefits that you want and need. Use the information found in this buying guide to get a quality motion-detecting light that will meet and exceed expectations. When you are aware of what is available, it will make your buying decisions much easier than if you just try to “buy blind” without first doing your research. Can these bulbs work if encased in a glass vase as an outdoor light. Hi, PIR motion detection unfortunately does not work through glass. Some of the products on this page are ok to use outdoors. 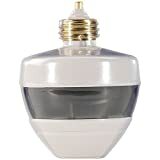 Which motion detector bulb should I use in a room that has a ceiling fan that is always on? I can point the bulb up or down.